I just have to be the only blog in the world to mention this. The DGT has the skids greased to go, as they go straight to a panel of old guys. This will save them lots of unnecessary trouble, such as explaining why the heck they went there in the first place! Anybody with any brains will stay away from this whole affair, and watch it from a dock, with a beer in one hand and a rod in the other! I said in a previous post that I would try to liberate some of the papers behind the paywall, summarizing them, as a harmless old fool, hoping that nobody gets mad! 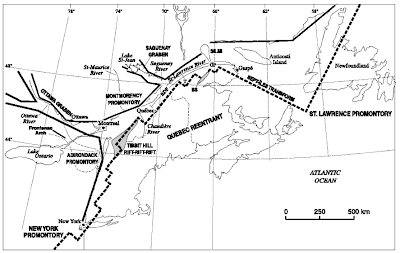 This paper was right in front of me, so I'll start with it: "A seismic-based cross-section of the Grenville Orogen in southern Ontario and western Quebec". You can see all the details on how to pay at the web site. You have to click on it to see anything! Note the beautiful megathrusts (3 of them!) at the western end. They are shallow dipping and go practically to the Moho. In the maps, they never go under the flat junk, but the lake seismic surveys all show them, clear as a bell. These happy triplets, the 3 Sisters I like to call them, become quite important when one tries to make a serious stab at Ontario geology. Throughout my long scientific career (now ended! ), nothing got me more excited than pulling up a big 'fish' of new data. I've always regarded science as fishing on the edge of great ocean, and once in a while, pulling out something interesting (didn't somebody else think of that first?). 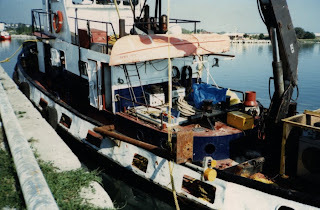 My very best fishing story was around the 80-90 decade boundary. We were looking for new nuclear sites, and this time, we actually had some money! (unlike the cheapies today!). We had heard rumours of 'sunken treasure', old seismic data, and we were looking for it. (This story has lots of credits to people who are smarter than me, yada, yada). It turns out that at one time, the Michigan Basin was a really hot place to explore for oil. This attracted the 'spec data' seismic boats, who are the true high-rollers of the sea. They gather data on spec, and sell it to the highest bidder. The big boats came in up the St. Lawrence Seaway, and went out the same way. On the way out, they decided to trail their kilometers of equipment and 'shoot' Lakes Erie and Ontario. This was in 1971, and 1985. The 1971 survey was done with Marine Vibroseis, which I still don't know how exactly it works, but these records went deep, right to the Moho! The 1985 survey was shot with conventional big airguns, which scare the fishies to death, and is very controversial now. Well, these crazy guys just processed the first couple of seconds, and saw to their horror, there was just a thin crust of 'good' layered sedimentary rock, on top of a horrible swirly mess of granites. These sections got out into the wild, and were declared worthless by other scientists. The poor guys sent them down to their cavernous storage libraries. Then we came along with our pockets jingling with coins. One of our experts noted that the data continued beyond their cut-off point, and might be good. We went down to Austin, Texas and looked at the tapes. It was amazing that they had saved everything, and it was all still readable! To cut this ramble short, they fell over themselves giving us a real cheap deal to process the data (in the hope they could sell the details! ), mainly because we only required 'relative data', not accurate enough to actually sink an oil well. Those gorgeous records showed magnificent structure right down to the Moho! 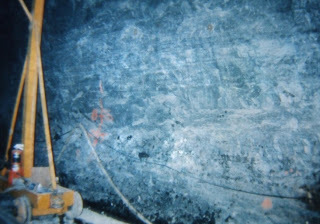 Many papers were written, and we got an excellent view of the deep crustal structure under Ontario. Most of my subsequent endeavours (and windmill charges!) were guided by this. As expected, the 'pancake rock' (sedimentary) guys continue to ignore this. Another day, and I'll dig up some of the sections. We love to see patterns in everything. For example, you may catch some fish in a bay, and think they should always be there when you come back. Most likely you'll never catch a fish there again! In fact, the human desire for patterns invariably leads to putting false patterns on everything. 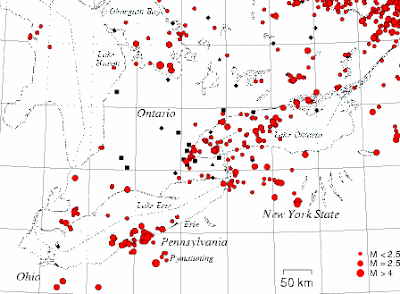 If you spray some random red dots on a seismicity map, and you expect to see lines, you will see lines. If more dots are sprayed, you will see more lines that are completely different! This is an unstable pattern, with the inevitable surprise, which you see all the time with hedge funds, and the stock market! In the 90's we were being killed with false patterns (and dramatic conclusions) hitting the newpapers. People would look at the inaccurate historical seismicity maps, along with complex geo-magnetic maps, and come up with a catchy soundbite of doom. At the time we were terrible with counter-soundbites. They would interview some rambling engineer for 2 hours, and it would be cut to 10 seconds .... "There will be damage......"
I decided that this Death of a Thousand Soundbites, could be addressed with some real science, and the management was beat up so bad that they actually listened! I set up a plan in my head to put in some decent seismic monitoring all over southern Ontario. This became the Southern Ontario Seismic Network (lots of credit to other people, blah, blah). As well, we started to improve the regional geophysics. I knew from other seismic networks (notably New Madrid), that real patterns would emerge if we could get location accuracy down to about 1 km. That's why I hustled to get some 'real' money into this. There was no use in just installing 1 seismometer! We started with 6 and then expanded. Here is a picture of the latest seismicity around Toronto. You only have to combine this with deeper crustal structure to start seeing something. The calculated Seismic Hazard speaks for itself, but there is a real danger of sucked into Soundbite Land, which is to be avoided at all costs! With all my canoe tripping, the thing I like most doing is gliding through a swamp. There's something about these fantastic carbon sinks that goes back into ancient geology. You dip the paddle, and glorious methane bubbles up. The biggest fish are also in the swamp, the really large largemouth squeeze into impossibly shallow water, just to get a chance at those millions of frogs! When I first entered the workforce, I got hold of this almost magical (like Harry Potter!) map. 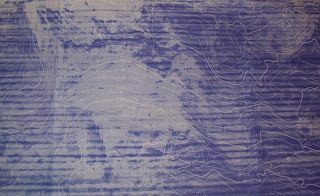 It was an old topo sheet, but it showed the old gas seeps, and farmer wells in the area. You know that there were no big companies drilling here. Most likely, farmers noticed the killed vegetation, and the bubbles, and sunk in a pipe to light the farm. I scanned part of the map here. You can see (Click on it!) all the gas wells around Binbrook, the heart of darkness (for major seismicity) in this area. When gas bubbles up, it means that fluids are moving deep in the earth, and this is significant for earthquakes. You don't see this gas towards Niagara Falls. In fact, we blasted two huge tunnels (and another on the way!) without encountering any gas. In the lake, the geophysics shows plenty of gas 'pockmarks' where the gas has blasted the soft 'loonshit'. No gas in Toronto, where this megafault hanging wall runs through the city, mainly because the sediments get thin, and not too much in the way of gas-generating oily shale. We did encounter some gas in a borehole at the old Lakeview generating station, and it nearly blew somebody's head off when he snapped off the cap! The presence or absence of gas and oil is an indication of the general openness of the rock (permeability). You're not getting any gas through my magnificent rock up on the north shore of the lake! Another story will tell my musings on the causes and how deep fluid flow is the ultimate driving force, projecting a fairly significant earthquake threat (seismic hazard ) to the whole Golden Horseshoe. There's nothing like the force of a largemouth bass hitting your feeble little fishing line. I keep the drag on light, and hope to tire it out before it breaks my line. When I'm camping with a bunch of fish-hungry teenagers, we'll eat the bass. But I remember once on Georgian Bay, when I caught a huge fish. I was ready to fight it, when the darn thing zoomed right under my canoe, snagged my line, and lept like a daemon, breaking the line. I always considered Georgian Bay to be a place of large mysteries. Today, I'm celebrating another Georgian Bay mystery, with an earthquake right where I expect a seismicity pattern will fill in. You can read all about this earthquake on the SOSN website. I had a lot of fun helping to put together this seismic network, but that's another story. This 'big fish' is part of a pattern that is filling in for that area. It's rather amazing that stable patterns didn't fill in for the Hamilton and Lake Ontario regions until we had good seismic monitoring for 15 years. The Bruce area was always considered totally devoid of seismic fish, because nobody was monitoring, and now they are getting caught. 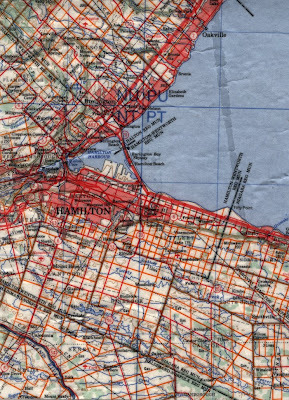 Over the next few years, I expect a full Hamilton pattern developing there, which means that it is a water-activated fracture zone on a major Precambrian megathrust, much like Hamilton and Prince Edward County. This weekend marked the start of the Bass Season. For all the spring, the mother fishies have attended their nests. At the marina, we could see a stationary double whirlpool, as some very large bass, deep below, was fanning her eggs. I celebrated by actually buying worms, but we only caught nasty little rock bass. When I catch a largemouth, I let it go, and it never goes after my hook again. I only catch the visiting tourists! Fortunately, people were taking this seriously and I had some money at my disposal. I configured this a big scientific endeavour where everything would be published (behind the paywall!). We had geologists map the whole valley. Nearly all features were classic ice shove, except one. We mapped that feature, and got the strike and dip. As you can see, the cliff side of the river is inaccessible, but the fault could be traced over the river to the nice flat side. There, we laid out 6 boreholes that were going to be drilled down to my favourite limestone marker bed, that I felt in my bones would be as flat as a billiard table. The wildcat drilling began! People who can get access to the papers can read all the gory details, but the big fault petered out, and underneath all the holes was our glorious marker bed, as flat as the day it was made! Still, it was amazing how deep the glacial damage had gone, and it clarified a lot of geological observations for me. All throughout Southern Ontario are these insidious clay zones, right in the middle of solid rock. The drillers hate them, because if they hit one when they're hung over, it can suddenly clog the water flow and blow the whole dang thing up! (Drillers are hung over a lot!). As well, the foundation of the CN tower was full of these clay zones and mashed up rock. I am now convinced that nearly all the surface sedimentary rock in southern Ontario can be mushed up to a depth of 20-30 m, which makes it almost impossible to come to some tectonic conclusion by just stumbling over a surface fault. All the more fun for geophysics! I've mentioned The Cliff, and it's glacially scoured surface, but the glaciers did more than make pretty lakes for fishing. I used to do a lot of computer analysis for a deep geological nuclear waste repository, and I became amazed at how deep glacial damage can go. It's not just that they pile up a great weight of ice, but they do it unevenly, building up shear stress. As well, they can pack a lot of water pressure, since most temperate glaciers have a high-pressure melted zone underneath them. What I found is that I would expect sub-horizontal open fracture zones extending to about a kilometer in depth, provided the surface was clean rock. This is exactly what they found when they were drilling and doing some excavation. It makes the Great North somewhat difficult for a waste repository. Below this fracture zone, in the Manitoba test site, they found rock at extremely high stress, so much so that it was almost impossible to excavate without the rock blowing up in your face! This damage is done over clean, permeable rock. As you get down to Toronto, a totally different type of damage is done. My analysis showed that if you cut off the water injection, there was almost no damage to the rock. This was shown with our deep holes drilled along the lake. I was not expecting, however, another type of significant damage. 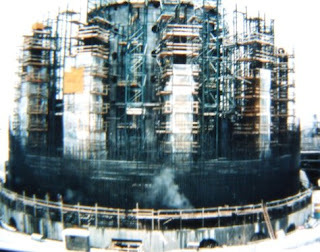 We were happily running nuclear plants in the mid-90's when all of a sudden, the newspaper headlines were filled with "Big Fault under Pickering". Naturally, it caught our attention. The tricksy Rouge River had cut right through a fault and exposed it for all to see. I had a look at it, and sure enough, it looked like a classic San Andreas. And this was on top of my lovely rock which I had said was not disturbed because of all the wonderful stress it held. I was stumped, and our feet were held to the fire! Fishing on the dock this weekend reminded me that it is a perfect bastion against negative geology thoughts. There, I believe that if you can't say anything nice about certain geology, then don't say anything at all! This was the Weekend of the Dragonfly, since they were especially dense, and constantly climbing out on the dock, doing their amazing changing act. Swooping all around us, they were our Terabithian Warriors, chasing bad thoughts and mosquitoes! 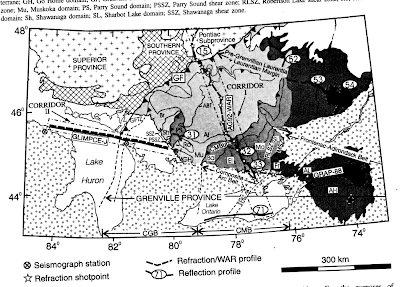 I can talk about the bad geology of the Ottawa region, since it is on the very fringes of Ontario. 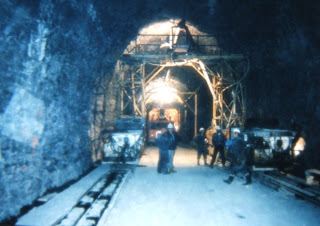 A long time ago, we were actually looking at putting in a nuclear plant at Chat's Falls, just north of Ottawa. A quick workup of the geology and seismic hazard, put the seismic design basis at a level beyond our ability to design, and the project was quietly dropped. Ottawa used to be as good as the best rock in Ontario, but got hammered by the Wilson Cycles, which are the repeated opening and closing of the oceans that have been going on for the last few billion years. 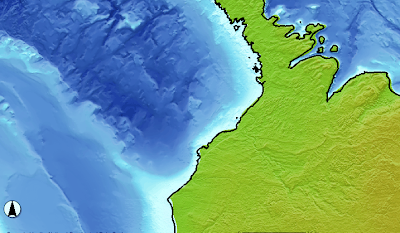 The opening before the current Atlantic opening was the formation of the Iapetus Ocean. 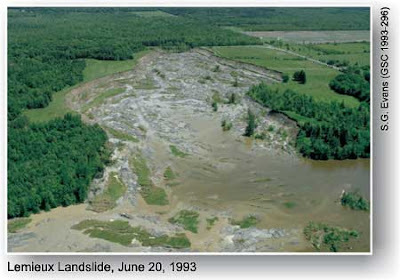 When this happened poor Ottawa got ripped apart with the Ottawa-Bonnechere Graben which is an aulocogen (failed rift). You can really see the rip in the DEM images! That wasn't enough for Ottawa! When the current Atlantic started opening, the Great Meteor Hotspot was passed over, leaving a giant track of volcanism and fractured rock. Think of a giant key being dragged over the underside of the continental car body! Here's a graphic of some of the mess around there. I've managed another one of my fancy DEM's for a section of the Ottawa Graben. You can see the straight gashes on both sides. As if that weren't enough, Ottawa then got dunked into the sea by the glaciers, and all sorts of marine clay was deposited. As mentioned in this article (started by me) quick clay is nasty stuff. It can turn into soup, right under your feet. So, three cheers for Ottawa, which acts like it isn't part of Ontario anyway..
On the dock I've got everything running, the fishing rod, the boat, and the dock itself. I was born (in engineering!) to believe that all systems should have a high engineering margin, which is the distance from failure, under normal conditions. When I was running computer systems, that meant a light normal load, about 10% of capacity. Earthquakes and fault systems aren't like that. They are always close to failure, although they are quite a mixed up lot. That means something is always failing on the San Andreas. It follows a Power Law. For earthquakes, almost all the seismic energy, general destruction, and displacement is expended during the largest earthquakes that can happen on that system. For most plate margins, these are the monster quakes, with a magnitude over 9! Popular conception is that the little quakes somehow 'relieve' the stress for the monsters, but the truth is that these guys are just setting up for the big one. When I was with the old Ontario Hydro, we were a monopoly, unanswerable to anyone. We put a high weight on reliability, lots of redundancy, and emergency capacity. We overbuilt everything! Finally, people bitched about the enormous cost of reliability (25% wasted, blah blah!! ), and that was the end of that. The giant techno-bureaucracies that control our lives have drained all their intellectual capital over the years (all the bright guys have left!). The natural state is to let everything drift to the claptrap level, which follows: "If it ain't broke, don't fix it!". You see this in the news with Quebec bridges and NASA. They have drifted to Power Law! What you never hear about are the smaller earthquakes, because they clean up immediately and shut up about them. Apparently, the claptrap Russian computers failed all the time, and they usually did a system-wide boot which cleared it up. On the shuttle, there are tons of little failures. For our electricity grid, local blackouts happen all the time, and you don't even want to know what I know! The Quebec guys didn't even respond to the news of falling concrete, because it happened all the time! All the damage comes with the big earthquakes. A nation-wide blackout. Blowing up the space shuttle. Losing the Space Station. A collapsed bridge. Blackberry communications lost. With the San Andreas, we can study it all the time and we know it's Power Law. With the claptrap organizations, they always just say: it can never happen again! 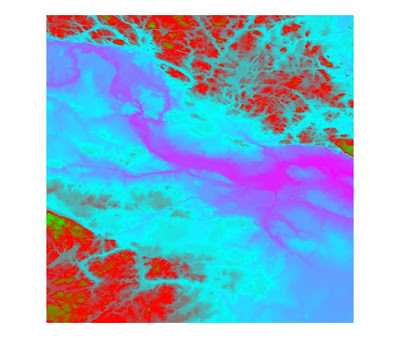 I'm trying something new, getting the national digital elevation maps, from Geobase and trying to plot them. So far a disaster! But's here's a nice picture of a section of the Bruce Peninsula. At a section of clear water, where I could clearly see there were no fish, those darn fishies kept appearing on the screen! I had to come to the conclusion that my new instrument was a bit enthusiastic on the fish-reporting thing. It still showed depth, but only to about 60 feet. I used to cruise with much bigger fishfinders, that didn't detect fish, but went right through the sediments, and bounced back an image. As well, there was side-scan sonar that bounced the sound waves to the side, and came up with something that looked like an airphoto of the bottom. Now, these boats were not all luxury cruise ships, they were downright decrepit, but serviceable, and we jammed a lot of equipment on them. 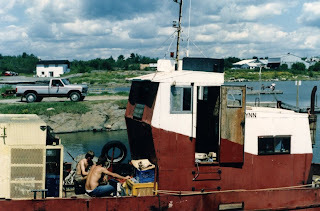 We used an even uglier boat on the North Channel, which was one of my most favourite summers. They still had commercial fishing there, and they used large, unmarked nets (shudder, shudder....). Here is a wonderful side-scan mosaic, which is composed of hundreds of individual rolls of paper (in those days, they photographed on a huge floor, now it is all digital). Of course, you really can't see all the neat stuff I can see, but there's a large sediment bay in the middle, with nice smooth silt. At the lower right, there's some rock showing, and right in the middle there are the little spots from dredge dumping. One thing we were really looking for was the rock, which has a unique sonic signature. 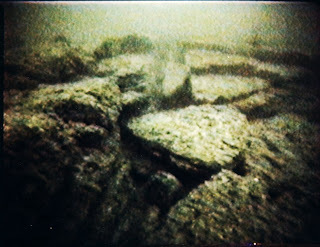 Here's a picture from a submersible, showing the type of rock we found. I think this came from a remote submersible, but we saw the same sort of thing from the navy 3-man submersible that is on my page. Stress is generally bad for you. I worked for 28 years in a giant techno-bureaucracy, and I've seen my share of stress. If you think NASA and the CDC are technological treasures, then you might not know what I mean. Now that I'm retired, I'm hoping that I can cut down my dose of anti-depressants. There is nothing that can reduce the stress more than a little bit of fishing off the dock (only if you are not expecting to catch anything!). Stress, however, in rocks is generally a good thing. It holds up mountain ranges, moves continents, and keeps the rock tight and impermeable. Rock without any stress is usually just a pile of rubble. Rock stress is basically the forces on an element of buried rock, divided by the area. I steal a bit from the wiki article I started on fault mechanics. On the wiki, you can never say you wrote an article, but you can say you started it. The arrows show the general squeeze that most rock is under. If the horizontal stress is much greater than the vertical stress (for shallow rock), then we say we have high horizontal stresses. In the early 80's we were quite amazed that we had high horizontal stresses in Southern Ontario. My mentor-manager Dr. C.F. Lee (now of the University of Hong Kong) and I, wrote papers on this. The high stresses caused problems for rock cuts and tunnels which were immediately cast with concrete, where the rock would squeeze in and virtually destroy the concrete. We did a lot of stress measurements. Most were of the overcoring variety (which is a bit dull), but we finally worked up to a deep hole, over 300 m in depth! This borehole went right through the upper Paleozoics (limestones), and right into the heart of the Precambrian! 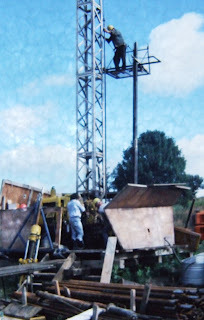 This shows our big ugly drill rig. 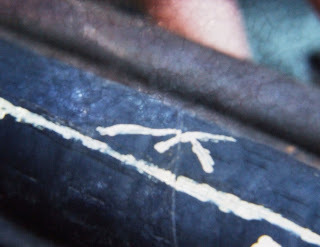 The decorative 'crackle' is a result of trying to digitize 35 mm slides. We used the hydrofracturing technique and got some interesting results. That's Dr. Lee standing, and Dr. Haimson bending over some results. 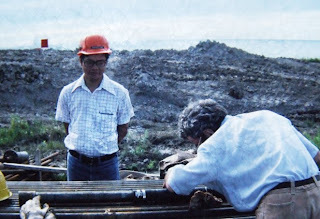 After the pressurizing of the water, and cracking the rock, Dr. Haimson made a rubber impression of the borehole to see the direction of the crack, which gave an idea of where the maximum stress was coming from. It turns out we had a very strong NE direction and a very high horizontal stress. In fact, the stresses were beyond the technique which has a limitation on the maximum ratio between the strong and weak horizontal stresses. The real mystery came later, as I wondered why in Ontario we can have such high stresses in some areas, and absolutely crap rock in others. In my younger days, I was greatly perplexed by the structure of the rocks around the lake. One day, I thought that I would map the rock structures all around, and look for good fishing spots, as well. 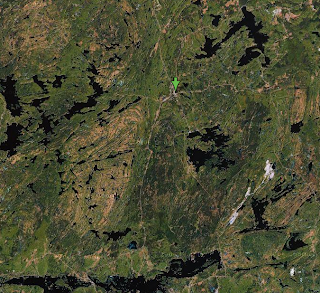 Here's a picture of the swirly mess we call cottage country (courtesy of Google Maps). Although it all seems horribly swirly, there is a persistent joint set (NW and NE), with faults to go along. The cliffs of the lake are where the joint sets are widely spaced, and the opposite for the very deep valleys. There are lots of quartz dikes in the same directions. About a billion years ago, this whole area was a colliding Himalaya zone. These rocks were buried, and stitched together with the super-glue of melted intrusives. That's why it is so stable. And yet there is this very ancient joint set that may have been there from the very beginning of time (for the rocks, that is). You stand on these rocks, your mind clears, and you float above a universe where a million years is just an eye blink. You stand on the very roots of existence. I don't always just play with the fish off the dock. Once a summer, we make a massive effort to go to a small lake with a lot of cooking-size largemouth. These are gutted with the skin on, oiled, and put on the BBQ. Yummy, but it fills my desire for fish, for the season. Nevertheless, as all good fishing lake are, this one is a slog to get to. Last year, we took the extended family, and started catching our quota. We had them on a string in shallow water, and then had our picnic. One of the kids noticed that two huge bass had quietly come up to our string. I swear, these were the Grandma and Grandpa of the lake! They could swallow our cooking fish whole, and I'm sure they regularly do! Their mouths were 3 inches across! Just for fun I dangled my flatfish lure in front of one. He snapped at it, mashed it in his enormous jaws for a while, and spat it out! We didn't have hooks big enough to penetrate any part of those scaly jaws, and my line would be thread to these guys. They eventually tired of our show and went away. Recalling the story, I thought of other 'dinosaur' projects we have done in Ontario. Not many people know we were once building a giant oil plant near Wesleyville. It was started in the early 80's, and was to burn heavy fuel oil, which was cheap at the time. The oil was to be stored in huge underground caverns. These were exciting times for a young geo-person. I visited the site and took pictures. This was the start of the massive chimney, which is now a major eyesore (good for boat navigation, though). These caverns were huge, and cut into the deep limestone. This rock was incredibly tight, and dusty dry, even though it was deeper than the lake. You could store the worst nuclear waste in here, and in 10,000 years it would probably penetrate an inch into the rock. A close-up shot of the rock. Absolutely magnificent! Needless to say, the price of oil skyrocketed (duh!) and the project was abandoned. The tunnels were allowed to fill up with rainwater. The site is currently used as a warehouse, and everybody can see the beautiful chimney! The fish around my dock are well trained not to take anything with a hook. I had tried many times with a worm on a hook, and they would never take it. After a frustrating time, I would throw in the worm, and see it instantly taken! Of course, I had caught most of them when they were young and threw them back. To get a real look at the dock fish, you have to descend with a snorkel. It's a different world, and the fish look at you with great indifference (some of them are quite big!). I remember another time I descended into another world. 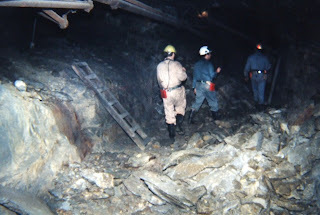 It was early 80's and we arranged a tour of a mine which had suffered a large rockburst. We clambered over the large chunks of rock which had been thrown right across the chamber! Never did I feel so weird and have such respect for the power of the earth! Here is a picture of one section. 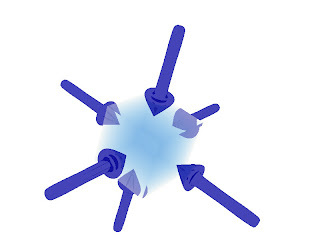 I realized that rockbursts and earthquakes were the same thing, and so I worked to unite the mechanics behind them. Every day, when I go dock fishing, I stare at The Cliff. I feel that all the small lakes are defined by their shoreline cliffs. Without cliffs, they are merely puddles! 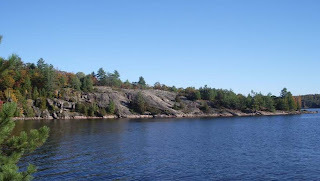 The cliff consists of billion year old gneiss, which has been smoothed by the glaciers. Bloodied by unbowed! Faults define the cliffs, and make for a deep lake. -The Private Domain - consisting of consulting reports and surveys that just end up before panels of old guys, for various approvals. You can imagine the quality of this stuff! -The Scientific Domain - consisting of reviewed papers, journals and books. Only accessible by the Elite Cartel, but better than Private. -The Public Domain - characterized by Wikipedia, and using sources that are on the web. I've done a lot of work for this, but it is severely limited by the sources you can get. In between fishing, I shall try to get concepts and papers (with which I have been involved) into the public domain. It may mean 'cartooning' the figures, and extensive translation, but it should be worth it. I was sitting on the dock the other day, with my hunk of Gulp on a line. I use a very small hook, and a long piece of Gulp. That way I don't really bother the big bass (who might be nesting right now), and I have a chance to catch a rock bass (which I kill). The rock bass are considered a growing pest in the Lake. I was staring into the water and watch a bass attack and spit it out with disgust, when I thought of my adventures with a much larger lake: Lake Ontario. It was in the late 80's. We had been putting nuke plants for some time along the lake, but didn't really know anything about it, other than it was deep and cold! At that time side-scan sonar was becoming more common and people were using it to scan for all the light planes that kept trying to land in the lake. Side-scan sonar gives great images of the bottom of a murky lake, and the first ones showed all these weird linear marks, and feathery lines. Naturally, the first persons who saw it cried Earthquake! and informed the press. I realized that people were going to start finding all sorts of weird things, so we had better start up a major effort. I easily whipped up a few million for this, since the nuke plants were being questioned. That's where I started my main 'thing': that all the data would be gathered scientifically, and placed in the scientific domain. I was just at the closing session for the Ontario Polaris Project, or Polo for short. You can read the write-up yourself. For more than 20 years I have pushed for more research in Southern Ontario, and I got it. The posters and sessions gave a lot to chew on when geofishing. For example, there is more evidence that soft soil on rock has an amplification of 50 to 100 times, in terms of total energy and Peak Ground Velocity (PGV). This lines up with the earthquake stories I have collected over the years. I even love the 'esoteric' stuff, such as whether the core has an 'icing' of high velocity material. The search for it is amazing! As well, there is a lot of work for microzonation for our cities. Montreal is funding some work, but in Ontario, they don't do anything special for earthquakes.